Columns are an ancient architectural detail, adorning homes and buildings for centuries. While many ancient societies implemented columns in their architectural designs, people are most familiar with the use in Greek and Roman culture. They are timeless, beautiful, strong, durable and unique – just a few reasons they have remained a staple of architectural design. But, just because they are ancient it does not mean they are outdated. Far from it, columns make a beautiful addition to any home or building and are sure to stand the test of time. Architectural columns are both ornamental and structural. They can be used for just one purpose or to serve both simultaneously. Many homeowners are implementing columns in their home to give it a timeless, elegant and high-end aesthetic appeal. Columns, like many stone architectural elements, can be used both inside and outside. Columns, in their most basic form, can be used to support weight. How much weight depends on the size of the column and the materials of which it is made. When you use a stone column you can be sure that you are using something with incredible strength and durability, capable of supporting a sound structure. In addition to providing support, columns add an interesting architectural detail to any home that enhances character and makes a home more unique. Today it can feel like many homes are cookie-cutter replicas of one another. With such similar and common features a home not only lacks uniqueness but may even feel downright boring. Even very nice, high-end and well-designed homes often lack a certain element of “something special.” Columns can be added to your existing architecture to enhance what is already in place while allowing you to put your own personal style into your home, making it truly your own. Columns can be used in a home to serve as a room divider, to accent certain architectural features, or in passageways throughout the home. Outside they can be used quite similarly and can also support balconies, as part of a structure outside such as a pergola underneath which you can sit and relax enjoying the weather or in many other ways. Stone columns are a great way to delineate space. Open-concept living is all the rage in homes right now but it is still critical that spaces within a home have clear delineation so that everything does not run together into one giant room. Stone columns are a beautiful way to help the eye separate spaces even when no walls are present. Stone columns can be relatively simple in design or quite intricate depending on how much hand-carving the homeowner prefers. There are stone column designs for suit any individual’s personal preferences and enhance any home’s architecture. Whether inside the home or outside, stone pots and planters are a stunning addition. When decorating a home it is important to pay attention to every detail, even seemingly small details, to pull together the entire look of your home in a cohesive and visually interesting way. An ordinary pathway, front porch or patio may look nice enough but it is the small details that elevate to a different level and transform a house into a home. Plants and flowers add a vibrant, natural element both inside and outside but they do not need to be stored in a boring, ordinary container. 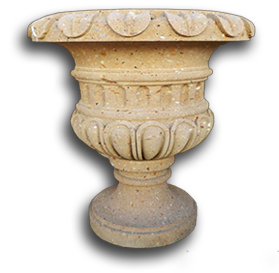 Display your plants and flowers in an intricately carved stone pot or planter. A fireplace is something that immediately draws the eye in any home. Whether large or small, a fireplace is sure to be a centerpiece in a room and something that should be beautifully designed because, inevitably, everyone will notice it. No matter what your home decor taste is, nothing exudes class, style and timeless elegance like stone does. 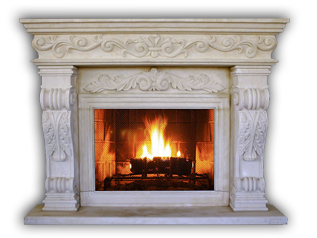 A stone surround on a fireplace can come in a wide variety of materials such as Cantera, limestone, soapstone and much more to suit anyone’s personal style and design aesthetic.